When I was still a meat-eater, my husband and I always enjoyed a crock pot full of juicy barbecue sausage balls. He actually joined me in vegetarianism upon his own volition a little over a year ago, so I can credit him for discovering the “sausage,” Lightlife brand’s Gimme Lean Ground Sausage Style, that I used it in this super simple recipe. I am perfectly fine without eating a meat replacement food, like soy sausage, soy chicken, etc, even though brands like Gardein are super and amazing, but sometimes it’s nice to mix it up and try some of the great meat replacements out there. Gardein does make a great pulled “pork” that is pretty close in texture to actual meat. Either way though, these are fabulous and you might (just might) be able to sneak these balls past a few of your carnivorous friends. ;-) The texture is different from regular sausage (of course, since it’s not meat! ); it’s a little stickier, and there’s less “gristle,” as we called it growing up in Alabama. One of my very carnivorous and somewhat anti-vegetarian friends tried these made as sausage patties on from-scratch biscuits. He said they were “good” and “tasted like sausage without the grease, that is, if sausage didn’t have grease.” If it gets at least one thumbs up from a lifelong, dedicated meat-eater, then you know it’s pretty good! 1 package Lightlife brand Gimme Lean Sausage Style veggie sausage, cut into slices and shaped into 1 inch balls. Heat oil in skillet on medium heat. When heated, add onions and stir fry until they start to cook down a little. Add the sausage balls, cayenne pepper and crushed red pepper. 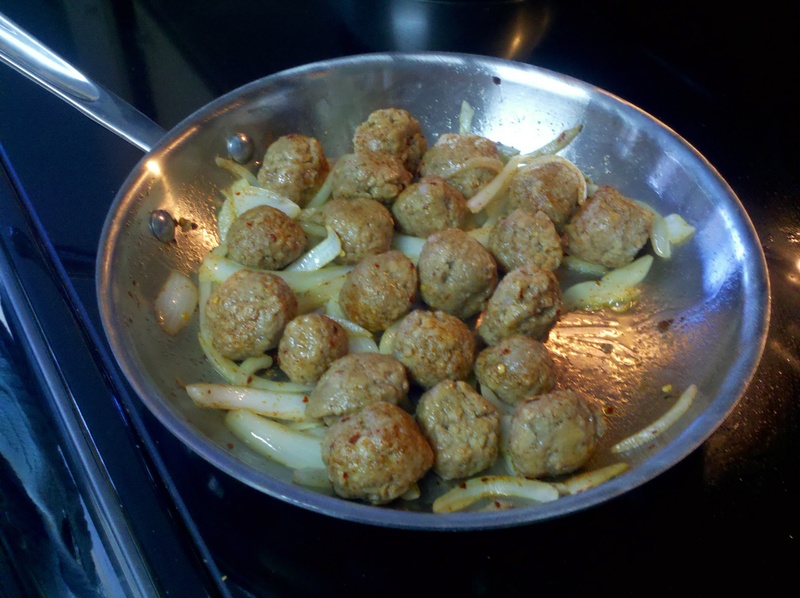 Sauteé until onions are cooked and balls are slightly browned on the outside. Once browned and onions are done, place into a bowl and pour the BBQ sauce over them and serve!